For women going through menopause, hot flashes can be among the worst symptoms, according to pharmacist and women’s health expert, Marla Ahlgrimm. 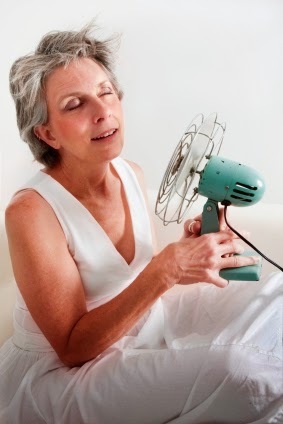 Hot flashes create a sudden feeling of overwhelming heat and may result in uncontrollable sweating. Traditional treatments are available, but in a recent study, scientists have found a new way to decrease hot flashes using a single injection in the neck. In the following Q&A, Ahlgrimm talks about the new non-hormonal approach to controlling hot flashes. Q: First off, can you explain what causes hot flashes? Marla Ahlgrimm: The exact cause is unknown. One theory is that the drop in estrogen levels that occurs around menopause affects the part of the brain which controls body temperature. Another theory is that changes in other brain chemicals may be involved. Q: What treatments are currently available for hot flashes? Marla Ahlgrimm: Hormone Replacement Therapy (HRT) works by increasing levels of estrogen, but it has also been linked to side-effects such as headaches, weight gain, bloating, and more seriously, an increased risk of breast cancer. Antidepressants such as Brisdelle or Effexor help with increasing levels of serotonin, though again there is a risk of side-effects. Q: Tell us about this new treatment. How exactly does it work? Marla Ahlgrimm: The new treatment is known as a stellate ganglion nerve block. The stellate ganglion is a collection of nerves in the neck. These nerves help regulate heart rate, breathing rate and blood pressure. They also regulate sweating and temperature. During the treatment, a local anesthetic is injected into the nerves with the help of X-ray guidance. Marla Ahlgrimm: The procedure isn’t painless, but the most common side effect is pain at the injection site. It is highly advised that only a trained anesthesiologist does this procedure.